Wellington, Kansas, nicknamed "The Wheat Capital of the World," was one of many towns along the Rock Island Line, a railroad route sung about by John Lomax in the 1930s and many others in the years since, most famously Leadbelly and Lonnie Donegan. Wellington had another connection to the music world: Chuck Miller was born there. Miller learned to play piano growing up, and as time progressed and he struggled to make a living as a musician, you could say that he regressed to plunkin' those 88 keys in a boogie woogie style. That's where his mindset was, at least, when he notched his one big national hit, "The House of Blue Lights." He had moved to Los Angeles after high school and worked as a piano man during the latter part of the 1940s, putting a band together by the early '50s with bassist Robert Douglass. Friend, saxophonist and occasional collaborator Dave Cavanaugh became an A&R man for Capitol Records and was Chuck's "in" to the record business. 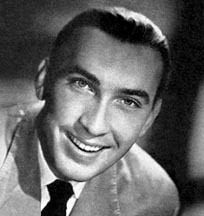 Five pop singles released between 1953 and 1955 fell with a thud, though towards the end he was drawing from the western swing songbook with songs like "Idaho Red." 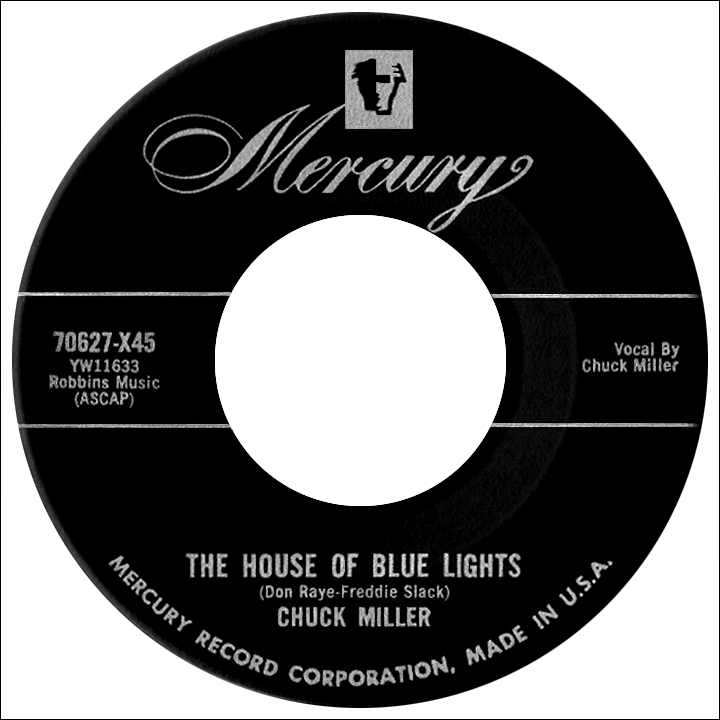 Capitol dropped him regardless, but Mercury Records gave Chuck a shot and encouraged him to explore his interest in a variety of musical forms. What developed was a hybrid style falling somewhere between pop, country and rock and roll. Ella Mae Morse had herself been the result of multiple influences, with big band, country and blues all evident in her ten-year run of hits starting in 1942. As a friend of mine once said, "Ella Mae is hot!" He wasn't exaggerating. A vocalist for Freddie Slack's band in the early going, she hit the scene doin' the "Cow-Cow Boogie" and never looked back. Except, perhaps, in 1946, when she ran into Slack at a record store (she'd been a solo artist for three years) and they decided it would be fun to make another record together, for "old time's sake." That chance meeting led to "The House of Blue Lights," a song Slack had written with Don Raye, the guy doing the "jive talking" at the beginning of the take: 'How 'bout you and me goin' spinnin' at the track?' to which Ella Mae snaps back with 'What's that, homie? If you think I'm goin' dancin' on a dime, your clock is tickin' on the wrong time.' Raye replies, 'Well, what's your pleasure, treasure? You call the plays, I'll dig the ways...' and so on. They ended up at the house in question. The record, of course, was a hit. Miller bypassed the spoken intro when he remade the song nine years later, getting straight to the meat of the subject, '...a knocked out shack on the edge of town...there's an eight-beat combo that just won't quit, keep a-walkin' 'til you see a blue light lit...' while making sure to put in a plug for those fryers, broilers and Detroit barbecued ribs they served up at the joint. The song may have been a bit dated, but then again people today still enjoy a place with hot music and good barbecue, so the message is a timeless one. 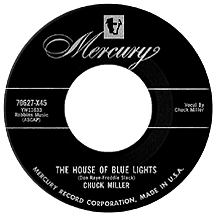 "The House of Blue Lights" entered the charts in June 1955 and reached the top ten in August. Chuck Miller, in his thirties by this time, had finally found the winning formula...or so he figured. Making the most of his sudden fame wasn't easy. The follow-up single, Boudleaux Bryant's "Hawk-Eye" (lyrically claiming surefire success with the ladies) suffered in comparison to the swagger of Frankie Laine's competing version. "Boogie Blues" came next, which he approached with delirious abandon. "Bright Red Convertible," "Cool it Baby!" and "Vim Vam Vamoose" all locked into the rock and roll attitudes Elvis brought with him in '56 (the latter even name-dropped the King). But not one of them came close to being a hit. He did manage another appearance on the national charts in early '57 with a cover of Leroy Van Dyke's country and pop hit "The Auctioneer," taking a less manic stance than on the previous three singles. He covered another Bryant song, "Bye Bye Love," but The Everly Brothers' original rapidly staked its claim as the definitive rendition. Miller's last Mercury single, Raye's "Down the Road A-Piece," was a retread of "The House of Blue Lights," always a bad sign. Creatively he'd hit that wall. Midway through 1958 his association with Mercury was severed, but he left several recordings behind him that are worthy of rediscovery. Imperial Records gave him a shot after that, but by the end of the decade his record-making days were over. Chuck didn't return to the Wheat Capital. He and Douglass went to Boise, Idaho and performed in clubs there for a couple of years before breaking up the act. Chuck Miller spent the rest of his life in the 49th and 50th states; Anchorage was his home for a time during the 1960s, then he opted for the climate of the south seas, residing in Lahaina, Maui until his death in 2000.